From here the story could take many turns. When the guy is David Sedaris, the possibilities are endless, but the result is always the same: he will both delight you with twists of humor and intelligence and leave you deeply moved. Sedaris remembers his father's dinnertime attire (shirtsleeves and underpants), his first colonoscopy (remarkably pleasant), and the time he considered buying the skeleton of a murdered Pygmy. The common thread? Sedaris masterfully turns each essay into a love story: how it feels to be in a relationship where one loves and is loved over many years, what it means to be part of a family, and how it's possible, through all of life's absurdities, to grow to love oneself. 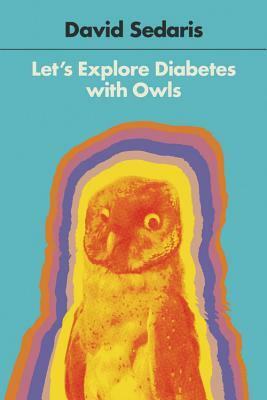 With LET'S EXPLORE DIABETES WITH OWLS, David Sedaris shows once again why he is widely considered the "the funniest writer in America" (O, the Oprah Magazine). David Sedaris is the author of the books Squirrel Seeks Chipmunk, When You Are Engulfed in Flames, Dress Your Family in Corduroy and Denim, Me Talk Pretty One Day, Holidays on Ice, Naked, and Barrel Fever. He is a regular contributor to The New Yorker and Public Radio International's This American Life. He lives in England.